Outlaw Hogs BBQ of St. Louis. 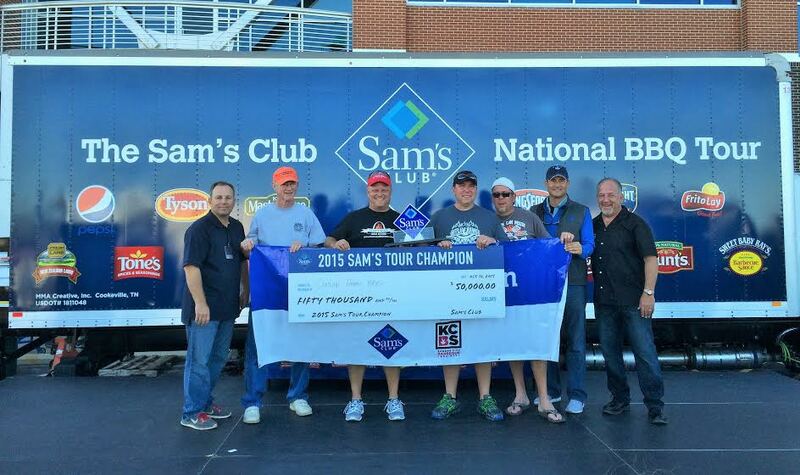 2015 Winners of the Sam’s Club National Tour. $50k prize! This was my first time judging an event linked to one of the bigger tours. This event had regional winners, so the expectation was high when it comes to the quality of the ‘Que. I certainly was impressed, but ran into another judge with a lot more experience than me recently and he wasn’t impressed at all. Glad I’m not that jaded! Boasting a $500,000 prize purse, the tour packs in 25 local qualifying events, 5 regional finals and then, a national championship at the Sam’s Club headquarters in Bentonville, Ark on Oct 10. It was a dark and stormy…..day. I mean the wind was howling! When I first arrived, I remember thinking, oh gawd, I’m going to freeze out here! Even though it was windy, it was still fairly warm since we were in the desert. But no, only the competitors were outside, poor guys and gals. I heard they had to endure pretty hairy conditions out there and I can only imagine. The judges? Not so much. We were tucked in all nice and warmy in an area inside of Sam’s Club. We were treated so nicely by the reps for KCBS, Dave and Virginia Londeen and by Sam’s Club, who bestowed a $25 gift card on all of us to be used at any Sam’s Club or Wal Mart. Perks are always welcome. As if eating great BBQ weren’t enough! For this contest alone, there was a $20,000 purse. Yowza. And the ‘Que was delish as usual. I only knew one or two of the judges, because most are local, but there are always a few that fly in from all over the country. I plan to do more of that next year.